2/10/18 – Teddy has found a home! 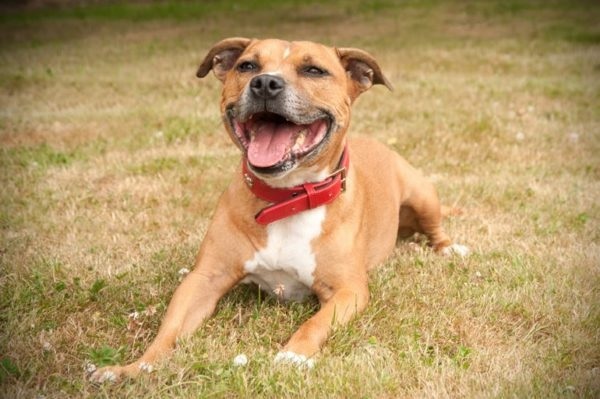 Smiling Teddy is a youthful 11 year old Staffy boy who is looking for a fairly active home. He is waiting at Foal Farm Animal Rescue Centre in Biggin Hill, Kent, and hopes he won’t be waiting too long for someone to fall in love with his happy face. Teddy is as fit as a fiddle and acts like a much younger dog. He will tolerate dogs at a short distance but he does not like them ‘in his face’, so he needs a home where he will be your only pet. He would love to live with a family – children would need to be aged 12+ – or mature owners who will give him the love and playtime he needs. Because he doesn’t want other dogs up close to him, Teddy is best walked in a low-dog-population area, or just having pavement walks plus playtime in the garden. Teddy loves to chill out in his bed, so if you had a really good-sized garden and could commit to exercising and playing with him sufficiently in the garden, Foal Farm would consider a home where he would have garden exercise only with someone wanting a companion dog that doesn’t need a walk. Could you be Teddy’s new family? Please mention that you saw Teddy on the Oldies Club website.